The Board of Directors of the Canadian Hockey Association will be voting on the Age Change Restructuring motion at the 2001 Annual General Meeting taking place May 18-21 in Ottawa, Ontario. The Age Change debate has been a hot topic with minor hockey membership in Canada over the past 12 months. The CHA minor hockey age change is one of the initiatives adopted by the CHA after last year's Molson Open Ice summit. This site is here to help, parents, players and any one else affected, the facts about the age change. OTTAWA, ON - The Canadian Hockey Association's Board of Directors, made up of representatives from the 13 CHA provincial branches across Canada, made a key decision in regard to the future path of minor hockey in Canada on Monday at the CHA's Annual General Meeting in Ottawa, ON. 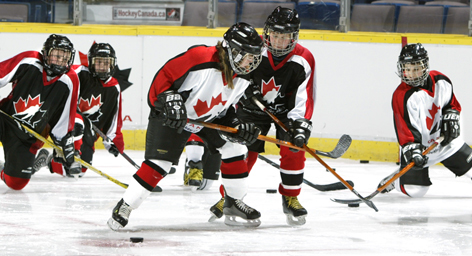 The CHA Board of Directors approved a motion that will change the age categories throughout all levels of minor hockey in Canada, taking effect at the start of the 2002-2003 hockey season. "I’m very pleased with the patience and methodical approach we took to making this key decision for hockey in Canada," said Wayne Russell, Chairman of the board. "These changes to minor hockey were based on a number of factors, including players' physical, psychological and social development, as we look to develop players skills while ensuring that it is an enjoyable experience." The age category change comes one year after the motion was tabled at the CHA’s 2000 Annual General Meeting, when the CHA membership requested more time to review, examine and gather feedback from constituents across the country on the proposal. For the 2002-2003 season only, CHA branches may, at their own discretion, define the age of graduating Bantam players determined either at December 31 of the current season or the date of June 30 immediately following the season. This means that the Bantam Division players, if this option is exercised, could be eligible for Bantam hockey to 15.5 years of age.